The Pantheon product range offers the right balance between quality and price, optimizing production process to offer long lasting products. The leading principle of our PM10 10 litre Planetary Mixer design is functionality and ease of use. The Pantheon PM10's versatility makes it the essential machine in Schools, Bakeries, Pubs, Restaurants, Fast Food Outlets, Nursing Homes and Hospitals. The range is completed with tabletop models the Pantheon 5 Litre Planetary Mixer (TM5) and Pantheon 7 litre Planetary Mixer (TM7). Floor standing models the Pantheon 10 litre Planetary Mixer (PM10), the Pantheon 20 litre Planetary Mixer (PM20) and the Pantheon 30 litre Planetary Mixer (PM30) completes the range. 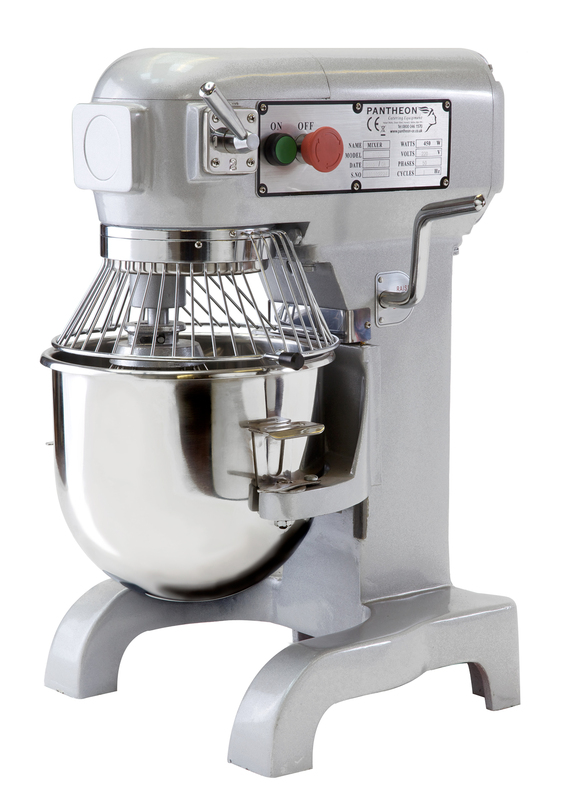 The Pantheon Planetary Mixer's main feature is the interchangeable utensils that can be used: dough hook, mixing paddle and whisk, allowing the user to develop a wide variety of product range (see accessories section). A removable bowl makes it easier for the user, so the dough can be taken out more easily, for further manipulation. Its variable speed allows for different levels of mass mixtures. Light batter for sponge cakes. 10 litre Stainless steel bowl. 3 speed settings: 91, 200 and 300 rp. Dimensions: 485w x 410d x 635h (mm). Power: 13 amps - 0.5kW.